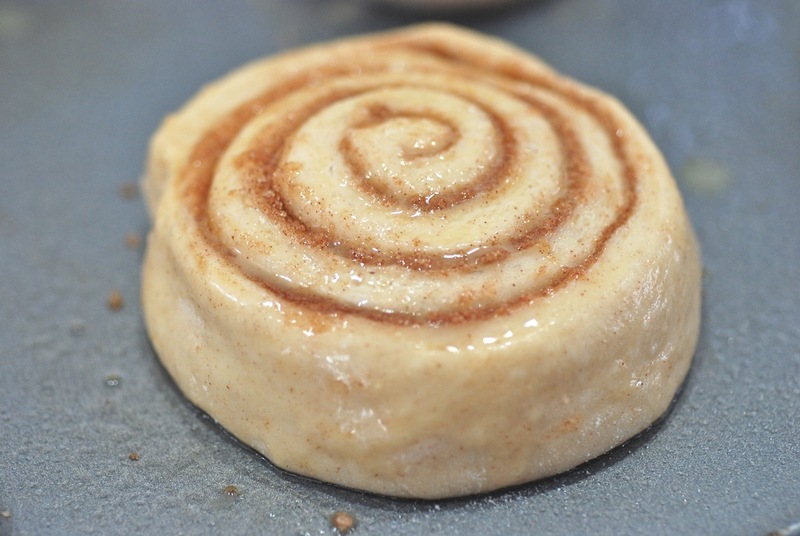 Yes, you can make delicious cinnamon rolls in just about an hour! Here's how. 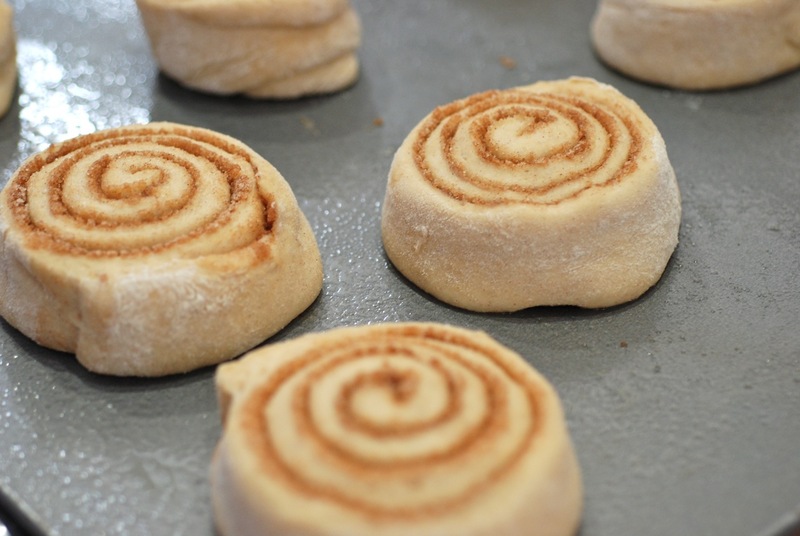 Following on the success of Grange Favorites Sixty Minute Rolls, and Whole Wheat 60-Minute Rolls, here is the next development: Cinnamon Rolls in 60, well okay, 65 minutes! I first became interested in the 60-minute Roll idea when my husband picked up the 1980 Vermont Grange Favorites cookbook at a garage sale. By slightly doctoring the recipe with sourdough starter, I found that I could make quick rolls that actually had character and flavor. I was hooked. The Grange cookbook is full of other good things, notably the hand-written recipe for German Peach cake that fell out of it, lots of ways of using maple syrup, and the provocatively-named Honeymoon cake. But I make the rolls regularly, and have been perfecting a cinnamon version for a while now. 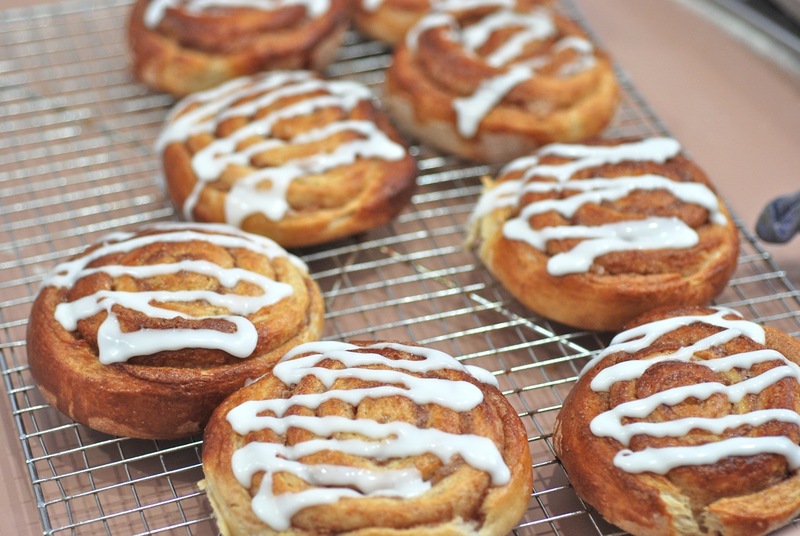 It is not a classic cinnamon roll recipe. 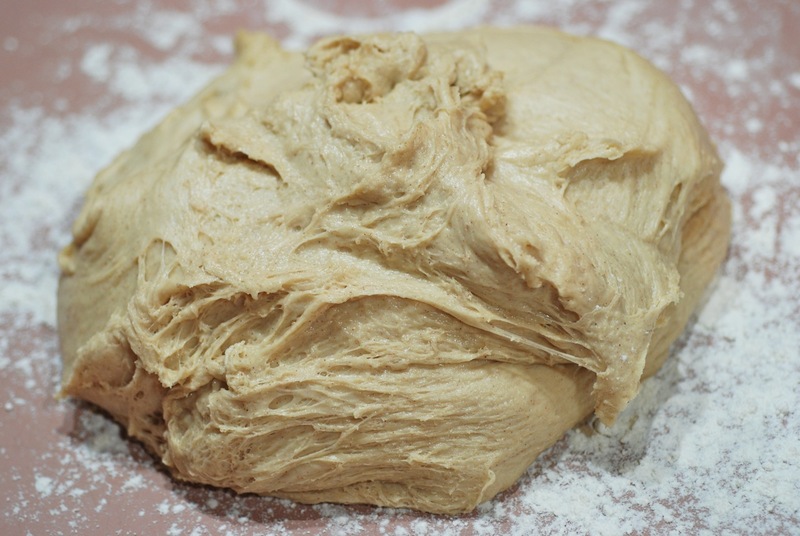 There is no resting the dough overnight, multiple rises, sponges, striated doughs, etc., etc. 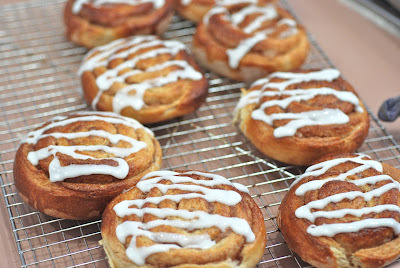 It is just what you need on a weekend morning (or evening) when you suddenly need cinnamon rolls. It is for when you'd like to fill your house with the yummy cinnamon-baking scent usually only found in malls, without going to the mall. 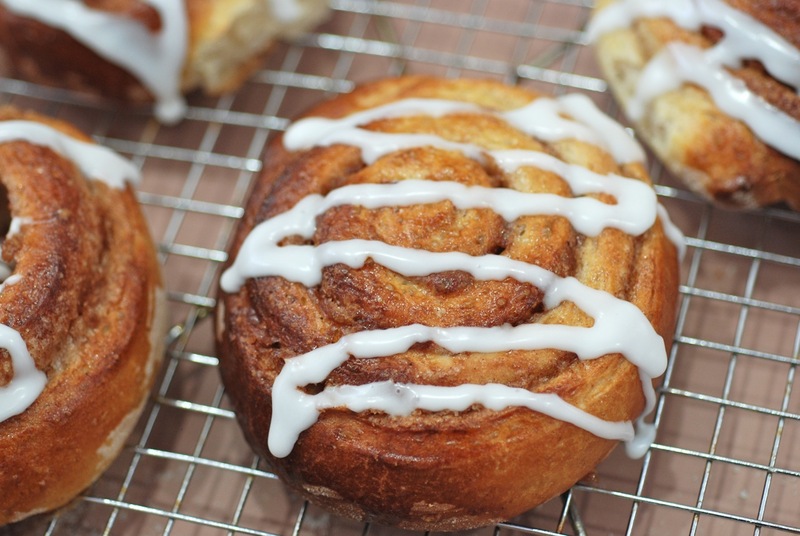 It is a recipe that produces surprisingly scrumptious, tender, cardamom-touched brioche cinnamon rolls. In an hour and five minutes. I think the Grange Ladies of 1980 would be proud of me. 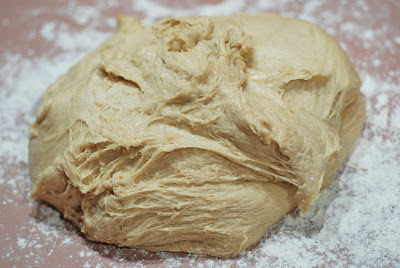 In electric mixer bowl with dough hook attached, combine dry ingredients; mix briefly to combine. Add wet ingredients and mix 1 minute to combine; mix 5 minutes more on medium. Dough will be smooth and elastic. Proof in warm area (90F) for 20 minutes, until almost doubled. 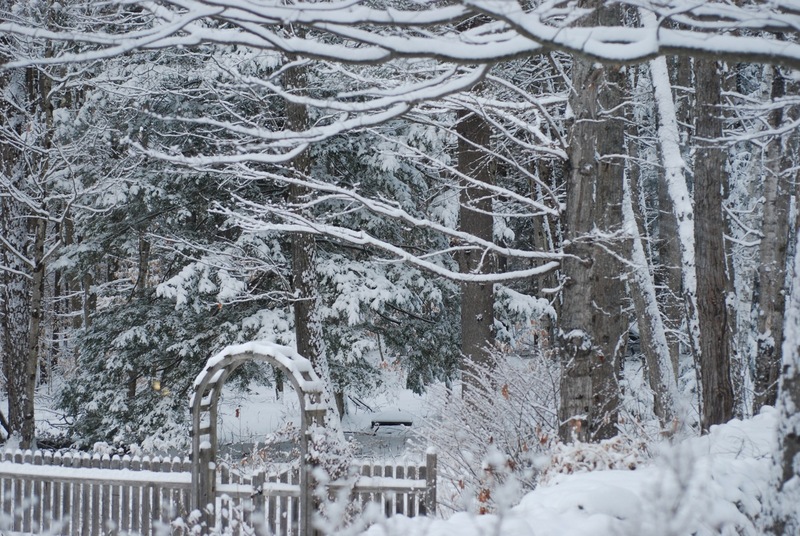 (If you do not have a warm area, this step will take longer). 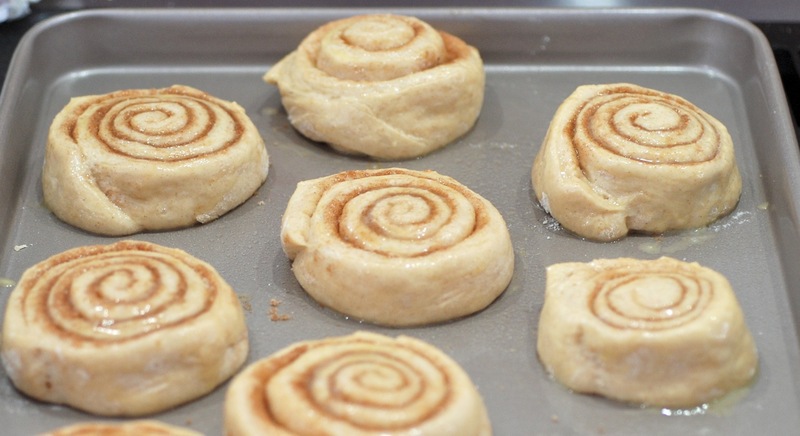 Tip: while the dough is rising, you can make the egg wash, and the icing. At the end of 20 minutes, turn out the dough on a floured counter. 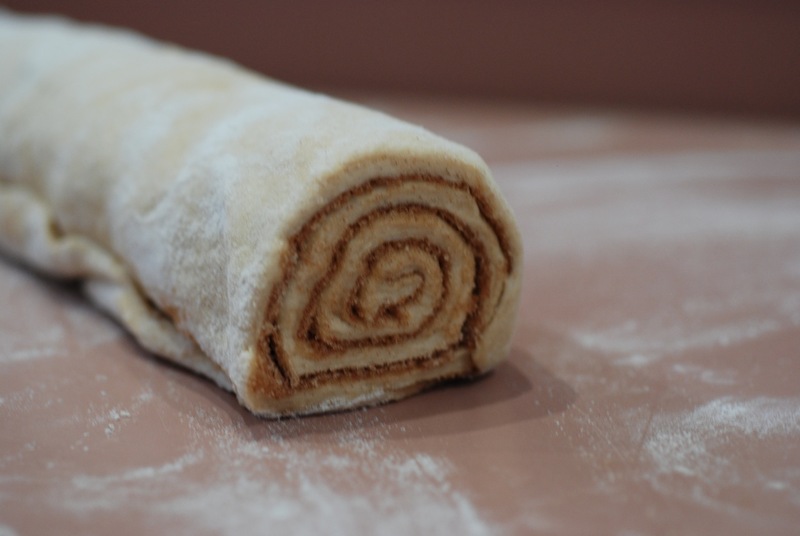 Gently roll out to large rectangle, about 14" x 18", and 1/3" thick. 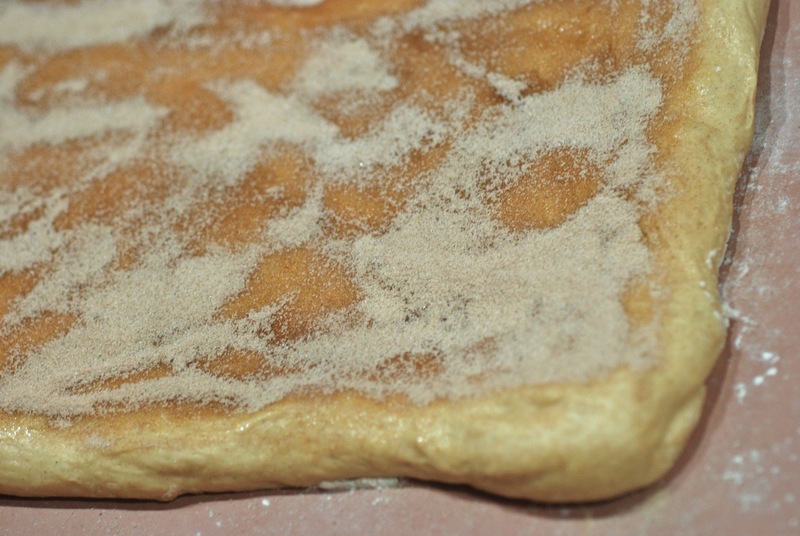 Dust surface with flour to prevent sticking to the rolling pin. Brush surface with melted butter. 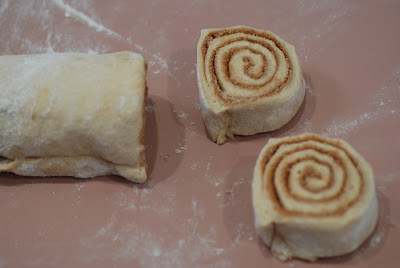 Then sprinkle a good coating (around 1 cup) of cinnamon sugar on top, avoiding the edges. Roll up the rectangle, to create a long rope. Cut 1" slices and place on baking sheet that has been sprayed with cooking spray. At the end of rising, brush again lightly with a bit of egg wash to refresh and moisten it. Bake at 350F for 20 minutes, until brown and glossy. 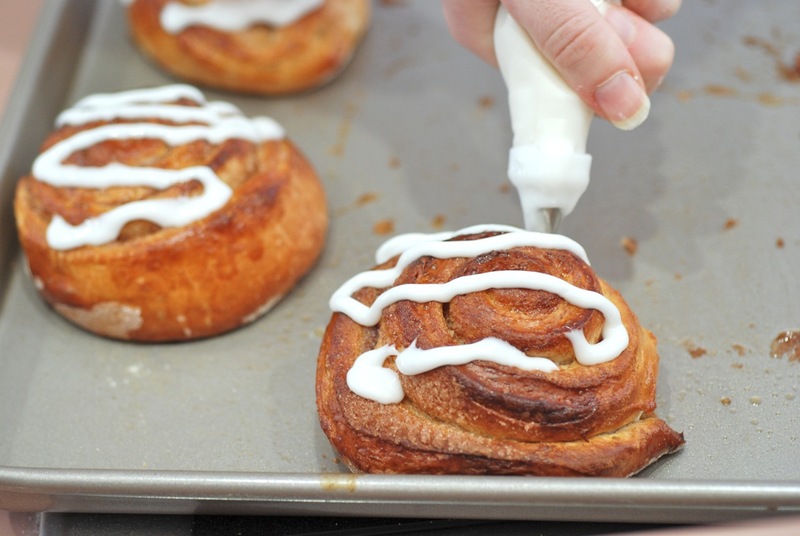 Mix icing ingredients together and pipe or spread on warm rolls. 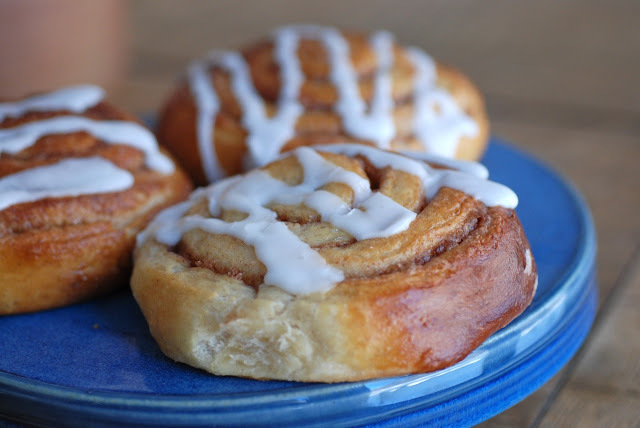 This sounds so amazing, just perfect for a busy mom like myself who wants the taste and texture of real cinnamon rolls without all the fuss. If I don't have the sourdough starter, do I need to just leave it out or do I have to substitute something? Thanks @Deborah Dowd! Yes, I wish I'd figured this out when my kids were little. I just showed my 20-something daughter how to make these for her roommates! These were wonderful. 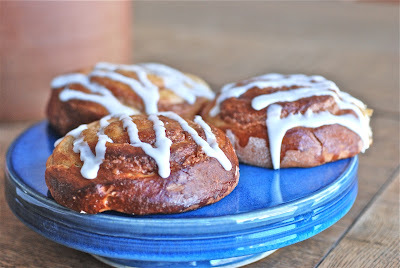 I made them Monday night and I'm about to make another batch this morning. My boys thank you from the bottom of their belly!